The Compound Solution Program For Puny Arms! It is time to get back to the basics that will help you pack on some size including your arms. Here I am going to introduce to you seven super effective exercises that will get the job done. Ah, the eternal quest for big guns. Ask any new male trainee what their goals are with training and chances are strong that you will hear about the desire for a decent pair of pipes. In fact the desire for bigger arms is so strong among male trainees that there are tons of books and hundreds of articles on how to get bigger arms. While many of these books and articles are good, the truth is that doing tons of isolation work for your arms will only take you so far. The body has to be worked as a complete package for individual parts to grow significantly. Moreover, it makes sense to focus on areas that will produce the most overall benefit. Enter the "Compound Solution Program." In this article, I am going to go over a different, albeit super effective approach getting much bigger and stronger. The side effect of this program will be a pair of guns that you can be proud of. According to strength coach Charles Poliquin, trainees need to add twenty pounds of muscle to their physique in order to add one inch to their arms. Sounds like pretty depressing news right? Not if you want a balanced physique rather than a "California bodybuilder look." Of course that brings up a good question. How come many male trainees have big arms and small legs? Doesn't this mean that you can get big arms without having big legs? Perhaps, but your arms and upper body will never be as big as they could be with a well developed lower body. Moreover, why would you want to have a weak foundation when you can have the entire package? Finally, if you have any athletic desires, forget about being effective on the field without some strong wheels. If you have to gain twenty pounds of muscle to pack on an inch to your arms it makes sense to focus your training regime around exercises that will build the most overall size. This means that isolation exercises are out and old-fashioned compound exercises are in fashion. It is time to stop using the squat rack for ten sets of barbell curls. Yes, you are going to have to leave the EZ-curl bars alone for a while and forget about triceps push-downs and skull crushers. Step Away From The EZ Bar. It is time to get back to the basics and focus on some proven compound lifts that will help you pack on some size on your entire body including your arms. Let's go over seven super effective exercises that will get the job done. and do not want you to go through further withdrawal symptoms by depriving you of the bench press. Regardless, I am going to have you do the bench press in a way that might be new to you. 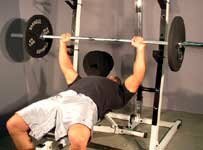 Instead of doing the bench press the traditional way, try doing bottom-position bench presses with a medium width grip (Medium being just an inch wider than shoulder width). 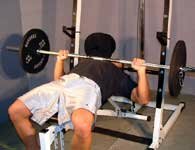 Bottom position bench presses are much harder than regular bench presses. It takes a lot of power and strength to lift a heavy barbell off of your chest without the benefit of doing the eccentric phase of the lift. Make sure that you use a power rack and place the safety bars at chest level. When you initiate the lift, take a tip from top strength coach Louie Simmons and imagine that you are trying to push yourself through the floor. Do not be surprised if you have to reduce the weight by 25% from what you normally use for the bench press. Pause for a second on the safety pins at the start of each repetition. 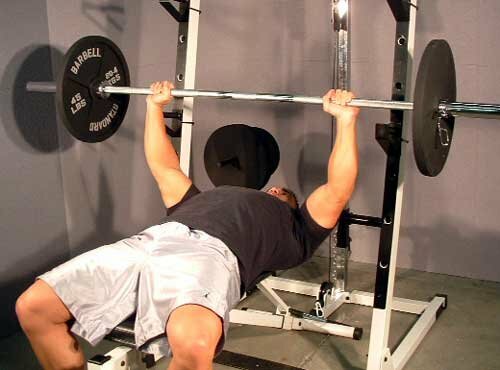 A mistake that many trainees make is focusing too much on the bench press and not enough on the antagonistic muscles. This is where the bent over row comes in. In addition to building up your back and lats, the bent over row will build up your biceps tremendously. Try to keep your body as stable as possible when doing the bent over row. Keep your back flat and look straight ahead at all times. Pull the bar to your stomach rather than straight up. Before you even pull the bar off of the floor, flex your lats and legs as hard as possible. This will give you the stability that you need to pull some heavy weight. According to Brooks Kubik, author of "
", years ago trainees used to look at the standing military press the way that trainees look at the bench press now. A 200 lb. overhead press is what separated the men from the boys. I doubt that you will see more than two to three people at most gyms today that can do a standing military press with 200 lbs. This is a shame as the military press is one of the best exercises for building up the triceps, shoulders, and upper-body. Use a power rack and place a bar at chest level. Breathe in as your take the bar off of the rack and start your set. Focus on flexing your legs, stomach, lats, and arms as hard as possible to press the maximum amount of weight. Forget about the lat pull-down. If you want a respectable pair of lats and some killer biceps to go with it, get to know the weighted pull-up on a first name basis. You Can Purchase An Excellent Weight Belt Here. Another option it to place a dumbbell between your feet, but that is not too practical once the weight gets past fifty pounds. Thus, do yourself a favor and invest in a weighted belt. If you cannot do any pull-ups yet, then make that your first goal. Do some negative reps off of the bar and have your training partner help you with the concentric portion of the lift. Do static hold in the top position as well and flex the lats as hard as possible. The weighted dip is referred to by many as the upper body squat. Once you try it you will see why it has this distinguished title. The weighted dip is the best exercise to build up your triceps. If you lean into it, it is also a killer exercise for the chest as well. In addition, the weighted dip requires a great deal of stabilization. Much more so than the bench press. If the weighted dip does not build up your triceps nothing will. To complete a rep, lower yourself slowly to the bottom position. Pause for a second and then drive out of the hole. Pause at the top for a second before doing the next repetition. We will be using the weighted dip as a chest exercise so make sure that your arms go out when you do the dip rather than keeping them close to the body. Don't worry your triceps will still get a lot of work. When it comes to building a strong pair of legs, the barbell squat is king. There is really no way around it. If you want big strong legs, you need to squat! Forget about the leg press and leg extension. All that the leg press does is compress your spine and place tremendous stress on your knees. Instead of doing quarter squats, or parallel squats, focus on using a complete range of motion. In other words, go as deep as you can. Pause at the bottom for a second and power out of it. By using a full range of motion you take the pressure off of the knees. When you go to parallel, your knees have to put on the breaks. If you find that you do not have the flexibility for full range squats, work within your limits and gradually focus on increasing the range of motion. The stiff-legged deadlift is basically the bicep curl for your legs. It will build up your hamstrings and even out all of the quad development that you get from doing barbell squats. You might be asking why I picked the stiff-legged deadlift over the regular deadlift. I will let top strength coach Ken Leistner answer that question, "The stiff-legged deadlift gives the spinal erectors and biceps femoris more direct work than the regular deadlift. 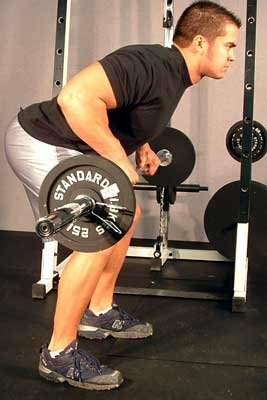 In addition to building up your hamstrings and spine, the stiff-legged deadlift will help build up your biceps as well. In addition, since the stiff-legged deadlift requires you to hold on to a heavy weight, expect your forearms to get stronger and bigger as well. I like to have my clients end each workout with a "finisher." A "finisher' is an exercise that is done for high repetitions (25-50) at the end of a workout to increase nutrient uptake into the worked muscles. "Finishers" will help you recover from workouts faster, which means more growth. At the end of each upper body workout, do one set of 25-50 pushups and at the end of each lower body workout, do 50-100 bodyweight squats. Here is a sixteen-week training regimen that will have you ready to purchase a new wardrobe in no time. The sixteen-week program is comprised of four four-week programs. Each four-week phase is a micro cycle in which training is very focused. The program changes every four weeks in order to avoid adaption and plateaus. This also keeps training interesting and challenging which are two important keys to training longevity. Phase one involves a full body workout that is done three times a week in order to bring you up to speed with all of the exercises and to hit the muscles hard. The more often you do something and recover, the stronger and bigger you will get. Also, practice makes perfect and this phase will give you a chance to practice each exercise frequently. Click Here For A Printable Log Of Mass Day. In order to save time and make each workout more effective, the exercises are paired up in antagonistic fashion. In other words, exercises that work opposite muscles are paired up into modified super sets. Here is how it works, do one set of A-1, wait a minute and then do a set of A-2. Again wait a minute before doing another set of A-1. Go back and forth until you have completed all of the sets and reps.
Once you have completed one pair move on to the next pair. Use the same weight on all of the working sets. Once you can complete all of the sets and reps, increase the weight by 5-10lbs at the next workout. Click Here For A Printable Log Of Power Day. Same instructions as day 1 with this workout. Click Here For A Printable Log Of Rest Pause Strength Day. In this workout, you are going to apply a super effective training method called Rest Pause Training (RPT). Legendary bodybuilders such as Mike Mentzer and Dorian Yates used this intense training method to blast through training plateaus and pack on size and strength. Here is how it works. Pick a weight that you can do three times with excellent form. Do one rep, wait 10-15 seconds and then do another rep and wait 10-15 seconds. Keep going until you have completed all six sets. If you manage to nail six sets, increase the weight by 5-10 lbs. at the next workout. This is an intense training method that will stimulate your CNS (central nervous system) tremendously. Rather than feel fatigued after a rest pause workout you will feel energized. One thing that you have probably noticed with this program is that the legwork is always in the middle. Barbell squats and stiff-legged deadlift workouts take the most amount of energy. Thus, doing them first might make you too fatigued to finish your workout. On the other hand, if you wait until the end of your workouts, you might be too fatigued to hit the exercises properly. Thus, we are going to take a lesson from the Buddha here and take the middle road. Now that you have a good foundation, it is time to take training up a notch and apply a proven training protocol. The 5x5 program was a favorite of legendary bodybuilder Reg Park and for good reason. It flat out works when done properly. Here is how it is done, do two warm up sets and then begin your first working set. Click Here For A Printable Log Of Monday-Thursday. Again do each pair in antagonistic fashion. Do a set of A-1, wait two minutes and then do a set of A-2. Wait two minutes before completing another set of A-1. After you have completed all five sets of A-1 and A-2, take a three-minute break and then move on to B-1 and B-2. Apply the same rest periods there. Same Instructions as Day 1. Click Here For A Printable Log Of Tuesday-Friday. Make sure that you rest up as much as possible on all of your day off. While this program does not look like that much on paper, you will find that it is very challenging (assuming that you are putting in maximum effort). Now that you have built a good foundation with Phase 1 and took it up a notch with Phase 2, you are ready to play in the major leagues. Now it is time to apply a method called the German Volume Training (GVT) method. GVT calls for doing ten sets of ten reps for each exercise at each workout. While the 10x10 program worked for many trainees, a lot of trainees found the volume to be way too much. One hundred reps per exercise is a hell of a lot and will get old real fast. I have found that 10x5 works much better. In addition 10x3 works very well as well. Thus, what I am going to have you do is do 10x5 in week one. Click Here For A Printable Log Of Weeks 1-3 Chest & Back. Click Here For A Printable Log Of Weeks 2-4 Chest & Back. Take ninety-second breaks in between each set of A-1 and A-2. Stick with the same weight until you can complete all ten sets. Once you can complete all ten sets, increase the weight by five to ten pounds. Click Here For A Printable Log Of Weeks 1-3 Legs. Click Here For A Printable Log Of Weeks 2-4 Legs. Click Here For A Printable Log Of Weeks 1-3 Shoulders & Lats. Click Here For A Printable Log Of Weeks 2-4 Shoulders & Lats. After four weeks of super high volume, you will welcome going back to full body workouts with much lower volume. In fact, the full body low volume workouts will feel like active recovery in comparison. Thus, we are going to end the program where we began. Repeat phase one for the final four weeks. After sixteen weeks on the "Compound Solution Program" you should have increased your size and strength tremendously. Moreover, your arms should look bigger than ever. At this point you have a great foundation in the most effective exercises for size and strength. In fact you could do the entire sixteen weeks again with a dumbbell only routine to really rock the stabilizers and really bring in some thick muscle growth. Tips To Maximize The "Compound Solution Program." Have a protein shake with some healthy fat two hours before each workout. Have a protein shake after each workout for recovery. Get a sports massage 1-2 times per month to enhance recovery. Take a cold/hot shower after each workout (30 seconds cold/ 60 seconds hot). If possible, take a 20 minute power nap after each workout. Take advantage of Cryotherapy and get a cryocup. Stretch for 10-15 minutes after each workout.